On 18 November 2016 the new digitised Rolls of Honour were unveiled at Winchester Cathedral by the Mayor.The digitisation of the Rolls, supported by Heritage Lottery Funding, was the result of a project developed by Sir Christopher Wallace, Chairman of Trustees of The Royal Green Jackets (Rifles) Museum (who passed away in January this year). 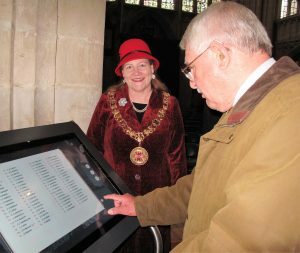 With the help and support of Winchester Cathedral and Hampshire Record Office and further assistance from The Royal Hampshire Regiment, the King’s Royal Rifle Corps and Rifle Brigade, the new touchscreen gives greater access to visitors to the Cathedral wishing to see names of those who lost their lives during the First World War. The Mayor, Councillor Jane Rutter accompanied by Mr Duncan Rutter were present at the short ceremony together with representatives of the three Regiments and Regimental Associations. The Lord Lieutenant was represented by Brigadier retd. David Harrision.